As a producer of natural beauty products I mainly use plant extracts to infuse colour. I use natural colours because not only are they much safer for all skin types but because they produce the loveliest natural tones that anyone could ask for. In cold-process soap I can achieve pinks with madder root, blue with woad, yellow from goldenrod and calendula, caramel from honey, beige with peppermint and purple with alkanet. Most of these plants grow in my garden at home but alkanet, has been difficult for me to find. I literally had to scour the internet for a month before I found a lead on some seeds. The first stop to trying to find alkanet was in speaking to the folks at Wild Colours. This is where my current batch of alkanet root came from and I thought to ring and see if they’d be able to sell me some seeds. It turns out that the lady who runs the business has been after some seeds herself for some time. They’re extremely difficult to find and it’s nigh on impossible to actually speak to the growers of commercially farmed alkanet in southern France. Our email conversation ended with me letting her know that I’ll pass on some seeds to her if I’m able to find any. After that I called every major seed distributor in the UK but they could only source common alkanet. This plant looks similar to dyers alkanet and can even be used in dyeing but it doesn’t have alkanna tinctoria’s deep purple colour. After those calls I occasionally went onto Google to see if I’d have any luck. I was at the point of giving up when I came across an old post for a dyers workshop run by a Ms. D in the USA. 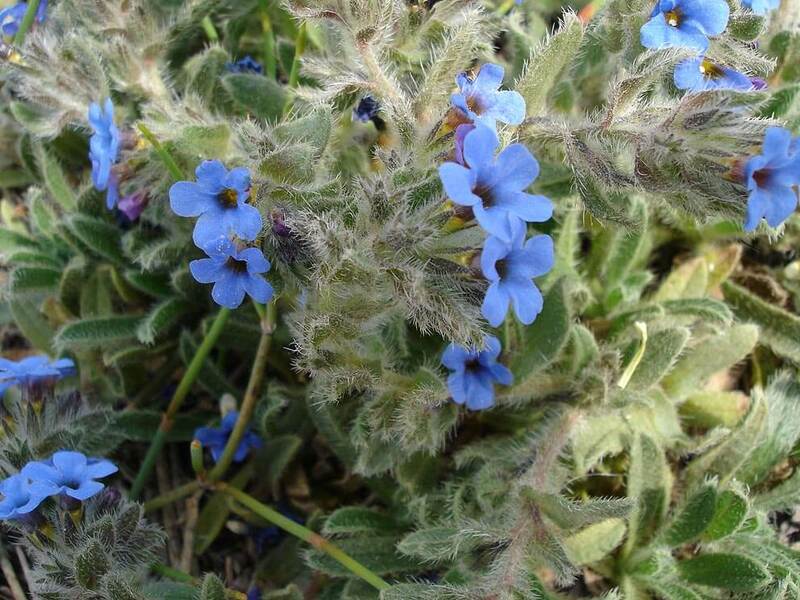 The post mentioned that she grew her own dye plants and that alkanet was to be used in her course. I came to find out that she does indeed grow alkanet and that she’d be more than happy to send me some seeds. A small packet arrived for me at the end of May and I immediately set to sowing them. Ms. D said that they have about a 20% germination rate and grow in conditions similar to their cousin, borage. I was relieved since I have tons of borage sprouting like weeds in my garden. If it had been any more difficult to grow I think I’d have been a bit more nervous. It really took some intense detective work to find them in the first place. If you’re looking for seeds yourself, there is an online shop, Strictly Medicinal Seeds, that supplies them. However, they always seem to be ‘out of stock’. Alkanet is also known as ratan jot and there are some bulk suppliers from India. It seems that most of alkanet produced in the world comes from that region now. Alkanet needs quite warm conditions to grow so I’m planning on planting under cover. Fortunately I had a really positive germination rate and out of the thirty seeds I started with, thirteen of them sprouted. That’s nearly half of them that made it. Since then I’ve let them grow on in the seed tray until they put out two true leaves before planting them up into individual modules. If you look in the image above you’ll see that the alkanet seedlings are planted in every other module – I’ve done this because I know how much lateral space that borage takes up and am predicting that alkanet will be the same. I hope not to confuse you but I did plug in some extra Thai Basil seedlings into some of the empty modules between the alkanet – I hate weeding out perfectly good little plants so popped them in there to give them at least a chance. 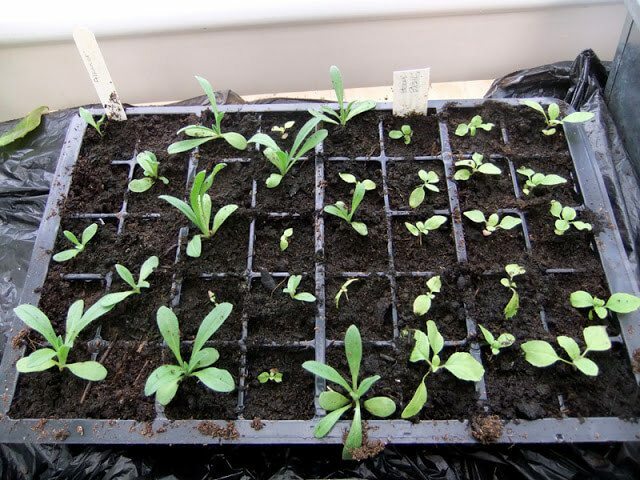 It’s quite late for these seedlings to be grown from seed but with luck and protection I believe I can keep them going before planting them out in their final positions next year. As a perennial they prefer warm sandy soil with more of a neutral or even alkaline pH and will be able to survive temperatures as low as -10°C. Though the plants will form rosettes of leaves in the first year, I’ll need to harvest the roots, which are what you use for dyeing, just before the plant flowers in the second year. I still need to find out exactly how I need to harvest them but I’m sure that Ms. D will help me out with that information. The dried roots are a deep reddish-purple in colour. For soap-making, it’s best to infuse oils with the roots to extract the colour. At the moment I have a large glass of olive oil sitting in my kitchen window doing this very thing. I have a recipe over here if you’d like to try it yourself. The tinted oil can be added to the rest of your oils when you’re ready to make a batch of soap. I currently use alkanet colouring in my natural Lavender soap. I’m also experimenting with using it with other ingredients to get both deeper shades. Dyer’s Alkanet is also used as a natural food dye. I’ts traditionally used Indian dish Rogan Josh and in tinting inferior Port wine to make it look a higher quality. However the main use for Alkanet these days is in the natural dyeing of wool and cloth. The colours achieved can range from a soft lavender to rich purple to even reds and greys. I’ve read that it’s all dependent on technique with one being soaking alkanet root in rubbing alcohol. My Alkanet seedlings are still small but I have high hopes for them. One of my goals is to grow all of my own cosmetic botanicals. Alkanet always seemed to be the one that I might not be able to have. Without small producers like Ms. D I’m sure I might never have had the opportunity to grow it. It seems that we have to increasingly rely on our gardener friends and neighbours across the world to preserve and share lesser known and traditional plants. All I can say is thank goodness we’ve got the internet to connect us and help in the sharing. UPDATE: the seedlings grew for some time but then failed. They aren’t fans of damp climates and since then I’ve not tried growing them again. You are probably getting fed up of people asking you for Alkanna tinctoria seeds. I see from the correspondance here that you are no longer growing them but I was wondering if you had any updates on where you might be able to locate some. About 3 years ago I bought what was advertised ast Alkanna tinctoria seeds from a German supplier “Ruhlemann’s” however the plants I grew turned out to have white roots without a trace of colour. I believe the seeds suppliers had bred a variety for its flowers and possibly for its medical properties and not for the dye and as a result had lost the red roots. Any help you could give would be much appreciated and If I can help in return in any way with dye plant seeds etc just ask. I see you have been involved in a social and therapeutic horticulture project at the local detention center. Interesting to me too as I am a horticultural therapist also. I’ve been in touch with someone who lives in France and is interested in investigating this. I still can’t believe that after all these years that Dyers Alkanet is STILL such an issue to get a hold of. 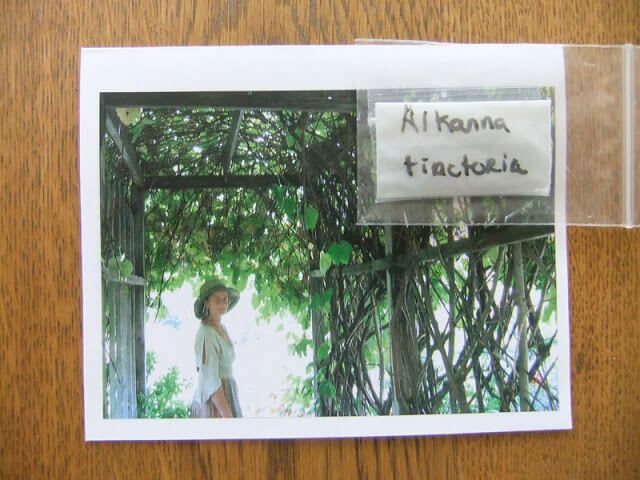 I just received Alkanna tinctoria seed. From what I have read it says to give the seeds a cold treatment for several months in the fridge. But reading about your experience growing these seeds you started them in good potting soil with good results. So I am double checking with you whether you gave cold treatment. The seeds are so tiny and hard to find that I want to do it right. If they came with those directions then follow them, I’d say. Mine came from a lady in the US with no particular growing instructions. They germinated without being stratified (cold treatment) but since the seeds are dear I’d follow your instructions to the T. Could you share where you got a hold of your seeds from? I have been looking for alkanna tinctoria seeds too! Could you share some of your alkanna tinctoria seeds with me? Let me know at: [email protected]. Thanks again! I’m sorry Anna but I’ve not grown it since the year I wrote this post. If I hear of any other sources I’ll let you know though. Hi I recently found this beautiful plant in Greece growing in pure sand about 50 meters from the beach. The article was very interesting I will be looking out for the seeds when the time comes. I found seeds originally through a natural dyer in the USA but to be honest haven’t been able to find seeds or plants anywhere else. 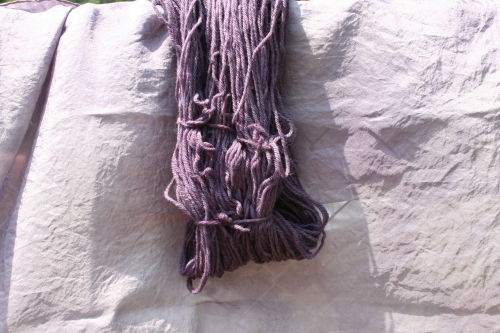 I’d recommend you get in touch with a local natural dyer if you’re interested in finding out more. Hi Lora and Mine – unfortunately it turned out that Alkanna Tinctoria prefers a much warmer climate and didn’t thrive here on the Isle of Man. I now have a native Alkanet growing in my garden but I don’t use it for dyeing since the pigment from it isn’t as strong and because I’ve now moved on to using primarily minerals to achieve blues. So I’m sorry but I don’t have any seeds for you. Mumasu – the idea of harvesting at the end of the season or before the flowers form/bloom is that the roots have a lot more energy (colour) at those times. At other times, the roots are more of a piece of equipment for supplying food to the leaves and flowers. I have been looking for alkanna tinctoria seeds for a while. It seems only way to get them is from other dyers. Could you share some of your alkanna tinctoria seeds with me? At the risk of being thick can I ask a question! Why do you need to harvest the roots before the plant flowers. Are you going to harvest some and let some run to seed. Do the dying properties in the roots change after the plants have flowered. Do you have to kill the plant to harvest the roots. Sorry that's lots of questions. Well done for your dedication in tracking down the seeds in the first place. Tanya this is a lovely post, and so interesting. 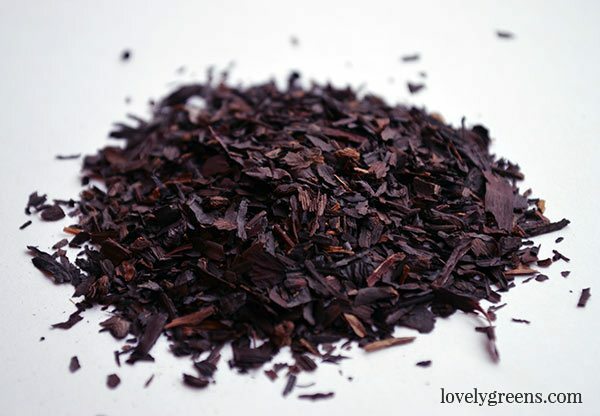 You are obviously very committed to producing the best natural products you can. 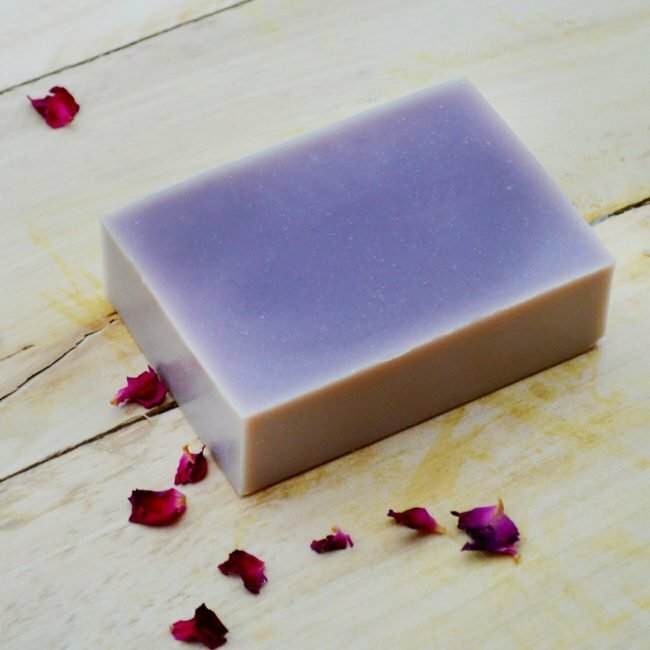 The lavender soap looks so good, and beautifully presented. Thanks Fran – they certainly are a beautiful colour aren't they? Thanks Staci – I have another great photo of various dyed wool using different natural colours and I was deliberating with putting it up or not. Ms. D sent it to me and I think I'll get a bit more information on which plants she used before I put it up.